Hashtags, sired by Metallic Cat and owned by Jose Raul Garcia, Caracas, VZ, scored 220 points under Tatum Rice to win the 2017 Lucas Oil NCHA Super Stakes. Melting Snow, owned by Buck Creek Quarter Horses, Nemo, Tex. and also sired by Metallic Cat, scored 219.5 points for the reserve championship under Clay Johnson. Hot Revolver, sired by Spots Hot and shown by James Payne, scored 219 points to place third for owner Kathleen Moore, Madill, Okla.
Hashtags made his debut as a 2016 NCHA Futurity Finalist (8th place) and this year has been a finalist in the Cattlemen’s Derby and the Ike Hamilton Futurity. Including his Super Stakes winner’s check of $74,095 and prior official earnings of $81,390, the blue roan stallion has earned $155,485. Rice, whose biggest single paycheck came when he placed third in the 2013 NCHA Futurity riding Johnny Reyngo, had NCHA earnings of $1,355,492 coming into the Super Stakes; he is slated to be inducted into the NCHA Riders Hall of Fame in June. Hashtags is out of Dual Rey Tag LTE $50,706, by Dual Rey; his second dam, Playin Tag LTE $220,949, won the 2004 NCHA Super Stakes Non-Pro with Cara Barry Brewer. Reserve champion Melting Snow LTE $77,803 was an NCHA Futurity Semi-Finalist and 2017 Abilene Spectacular finalist with Clay Johnson, who had won the 2012 NCHA Super Stakes riding KR Isadora Dual LTE $146,164. Melting Snow, a $280,000 purchase at the 2015 Western Bloodstock NCHA Futurity Sales, is out of a full sister to Dual Rey, cutting’s #3 all-time leading sire of NCHA money earners. 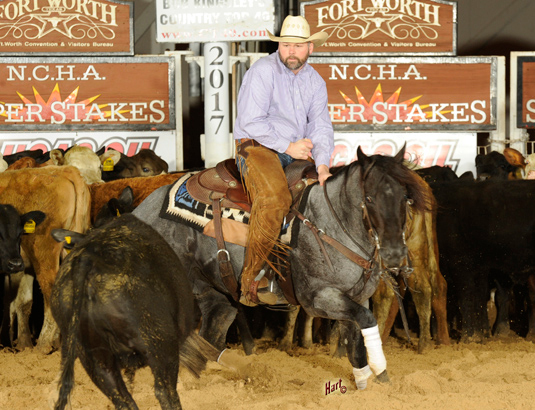 Clay Johnson, winner of the 2013 NCHA Futurity aboard Dual Smart Kitty LTE $316,251, by Dual Smart Rey, is a member of the NCHA Riders Hall of Fame and has earnings of $994,363. Hot Revolver LTE $65,249 was an Abilene Spectacular and Arbuckle Mountain finalist under James Payne, before coming to the 2017 NCHA Super Stakes. The gray daughter of Spots Hot, sire of 2016 NCHA Futurity champion Second Spot, is the first performer out of Baretta Boon LTE $58,000, by Playgun. James Payne, an NCHA Hall of Fame Rider and earner of $2,470,281, has had two previous NCHA Super Stakes finalists and was reserve champion in 2013 on Quick Be A Cat $83,786.